There was an interesting question on the VMTN forums last week on capturing the list of supported guest operating systems using the vCloud APIs. This feature is currently not available today using the vCloud API, as it there is no way to extract the list of supported guestOS identifiers. If you take a look at the vCloud Director User Guide, you can get a list of supported guestOSes, but it does not translate to the API identifiers that is needed when provisioning a VM in vCloud Director. The list of supported guestOS types are stored in the vCloud Director database and you can extract the guestOS IDs if you have access to the database or a DBA that manages the database. Using the following SQL query, you can get the list of supported guestOSes that includes the API ID and description. Since the list of guestOSes are inserted upon installation, I have already captured the output for a default vCloud Director 1.5 instance for your reference. Disclaimer: This SQL query is not supported by VMware nor should you directly access the vCloud Database as a best practice without the consent of VMware Support. 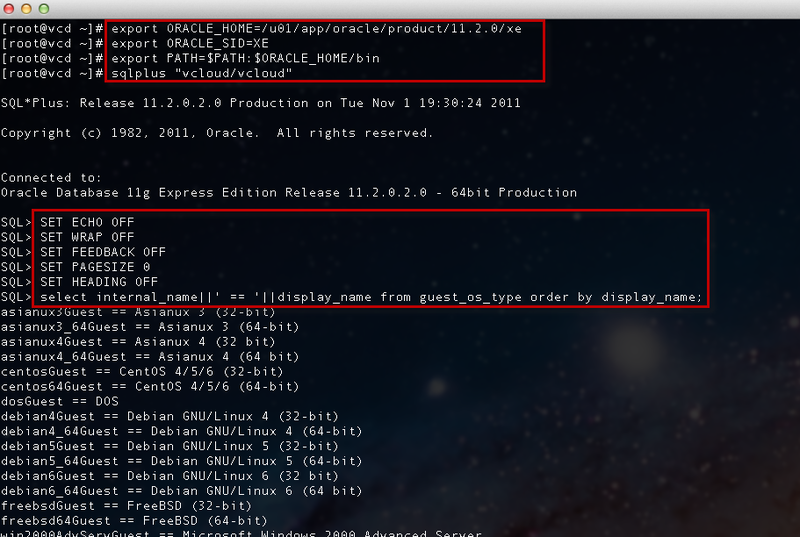 In this example, I am querying the list of default guestOSes from a vCloud Director 1.5 instance that was installed on Oracle XE database. [[email protected] ~]# sqlplus "vcloud/vcloud"
Note: I am not a SQL expert nor DBA, I am sure there are other variations of formatting. If you have ever worked with the vSphere API, you will notice the guestOS API IDs are exactly the same as the guestOS Identifiers found in the vSphere API. vSphere 5 supports a total of 105 guestOSes and 80 of those are supported in vCloud Director. A feature request has already been submitted to be able to query for the list of supported guestOSes using the vCloud API. For now, this is another way of retrieving API guestOS identifier without having to manually create each guestOS type through the web interface and query for the identifier. I got any other question in my mind, let say I want to extract the list of all RHEL VMs from the vCloud director. Is there any specific variable can be used to filter the RHEL VMs ?